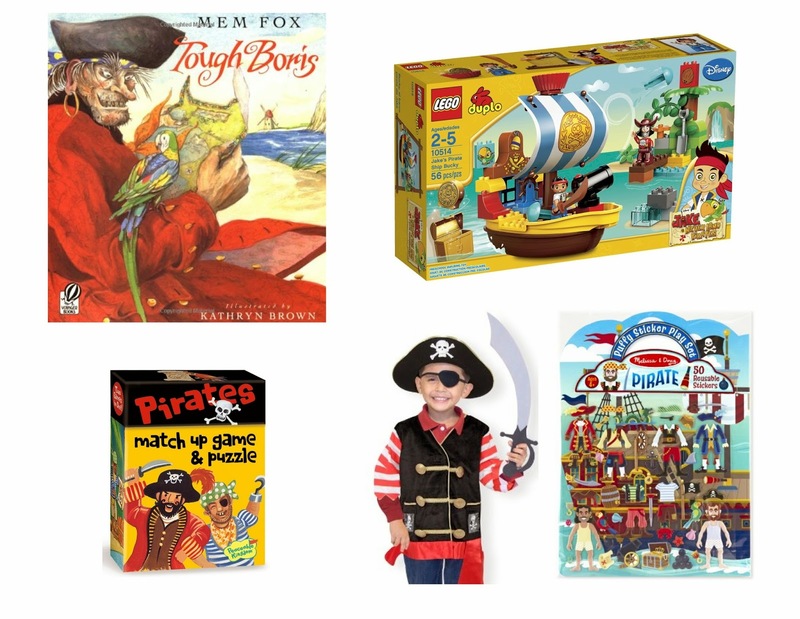 [Note: I was going to title this post Holiday Gifts for Toddler Boys but then I realized that I love (and loved) many of these items as a kid and I am not of the male persuasion. A kid at heart? Yes. I’ll wear that badge proudly]. I always hesitate a bit when writing these gift posts. The primary reason is that we’re trying hard to have the focus of the holiday not be centered around getting piles and piles of (admittedly wonderful) new things. So there are perhaps one or two toys from the below lists that our son is actually receiving. Of course, in ferreting out the things we’re going to purchase, we discovered lots of other great gadgets. But sadly those lovely items will have to entertain another child as they won’t be coming down our chimney come Christmas Eve. First, let’s talk about what Ben’s list looks like. It can be summed up simply as: duplos. I know this because he has me rewrite his Christmas list on a daily basis. There is never anything besides duplos; but he’s worked himself into a tizzy deciding which sets he really, truly needs. He tells me, most sincerely, that he has to have them all. I try not to roll my eyes within his view but I find myself exiting both the conversation and the room several times an hour. It’s going to be a long time until Christmas, let me tell you. The kid goes through obsessions like he changes clothes (frequently). But at least he stays true to his toy genre for the duration of the crush. Here is today’s list. Tomorrow’s will, I’m sure, be different. Learning Resources Pretend and Play Doctor Set $34 What kid doesn’t love giving his mom an injection? It’ll only hurt for a little while, Mommy! Plus, I like games that let me lay on the ground and pretend to be dead. Weirdly enough, it’s relaxing. Whoopee Cushion $4 This one never gets old. Ever. 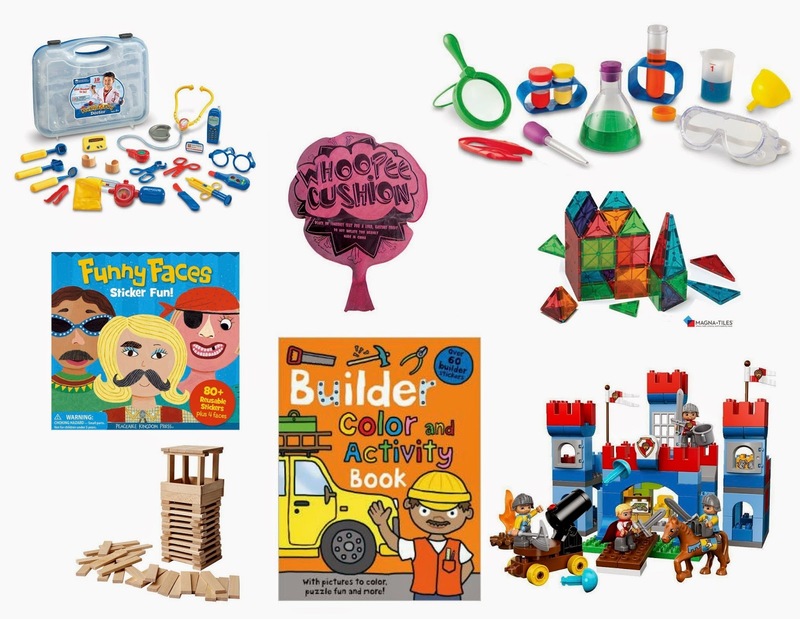 Learning Resources Science Kit $26 Mini evil scientists unite! I was a big fan of ‘potions’ when I was a kid. Mostly it involved mixing the shampoo, conditioner, and body soap all together in a big puddle on the shower floor. Peaceable Kingdom Funny Faces Sticker Fun $10 [for another option see below] Pirates with mascara and hair bows? YES. Magnatiles 32 pc Set $52 Parents rave about these magnetic toys. Personally, I like that they’re lovely jewel tones, not the god-awful primary colors that most toys sport these days. Ikea Fundera Building Blocks $10* We like towers in our house. Because you can knock ‘em down. Destruction is a winning theme ‘round here. 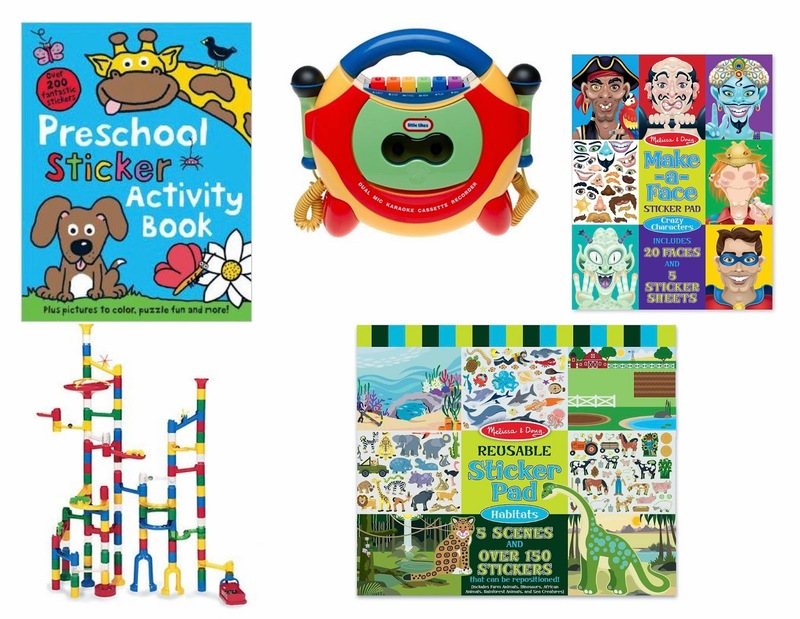 Builder Color and Activity Book $4 Great for road and plane trips. We have another one by the same author and it’s fantastic. Comes in several themes. 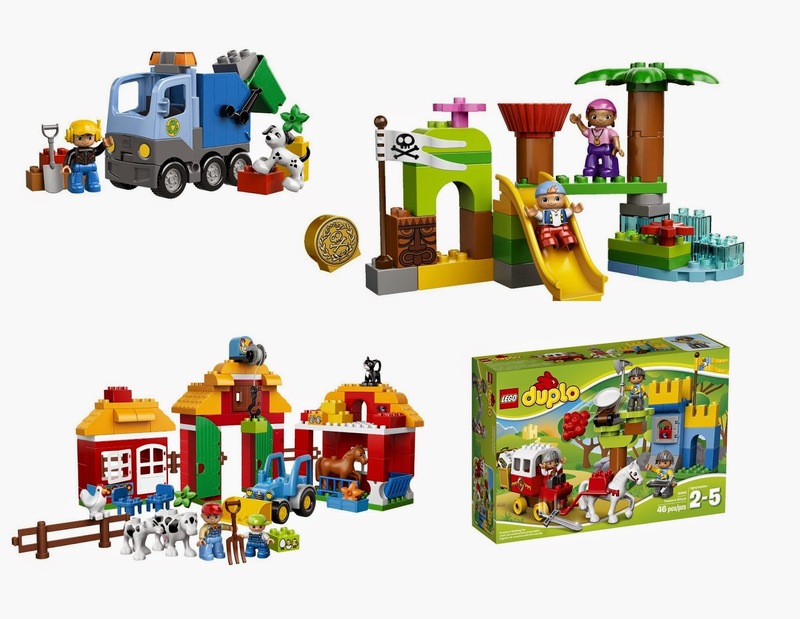 Duplo Royal Castle $90. He’s been begging and begging for this one. But $90(!) for a few pieces of colored plastic. I’m not sure I can drink that kool aid. *Speaking of Ikea: One thing that didn’t make our list is a tent or teepee. Ben has one and has little campouts in his room every night. His own personal reading nook. Ikea has a pretty nifty version here. Preschool Sticker Activity Book $6 We love this thing, as evidenced by the fact that it’s looking pretty sorry these days. The pages are drawn-upon, the stickers have been stuck, and we’re ready for a new version. Tape Player. Price varies. So admittedly this one is only good if you have tapes. My in-laws gifted Ben a tape player and about 20 tapes that were leftover from my husband’s early years. Ben adores this thing and it goes to bed with him every single night. All the goodies are obtainable: Peter and the Wold, Sesame Street, Joe Scruggs. Plus it’s (knock on wood) indestructible. Our best recommendation: Seek out the temple of Ebay. Melissa and Doug Make-a-Face Sticker Pad $5 Ok so we don’t actually have this one but I think we may spring for it in the near (cough Christmas cough) future. Comes in the typical variety: crazies, animals, and princesses. Mind Ware Marble Run $34 It’s hard not to buy all the awesome toys from my childhood. This one was (and continues to be) a winner in our house. Just don’t let the baby vacuum up the marbles with her mouth. Melissa and Doug Reusable Sticker Pad $5 Another road trip winner. This one comes in a ton of versions: Habitats, City, Princess! Does a cheetah live underwater? It does in Ben-Land. Lest you be concerned that Ben only has a one-track mind, feast your eyes upon his little side obsession: Pirates. My mom has the book Tough Boris by Mem Fox, who happens to be one of our favorite authors. Tough Boris is a gem: it has pirates (argh!! ), beautiful illustrations, and is a good lesson in compassion and empathy. It’s Ben’s #1 book choice over at her casa. He also recently sold a bunch of old toys and obtained for himself a mighty pirate ship, courtesy of (you guessed it), Duplo. He loves the fact that it has a cannon that fires a plastic projectile. I hate the fact that it has a cannon that fires a plastic projectile. We have a book list coming tomorrow night. Anything we missed, darlings? What is your kiddo jonesing for these days?